When I used to work in Hong Kong before lunch on styroboxes was one of my regular meal, it’s quite easy to order too as you only given four meat options and three sauce options which in total makes 12 different dishes but they only need to prepare four things. Meat choices are beef, chicken, pork and fish while the sauces are corn, tomato and black pepper. One of my favourite ones are the fish and corn, beef and black pepper and this recipe today beef and tomatoes. If you closely look at the dish it looks similar to the Western beef stewed in tomato but there is one big difference, this is not stewed, it is stir fried eventually making the cooking time drastically faster which can take a maximum of 15 minutes. It gives a different taste and effect as well as this one tends to be on the sweeter side and goes really well with rice and some simple Asian greens on the side. Mix all marinade ingredients together, add beef making sure marinade is distributed evenly. Set aside for 30 minutes. Place wok in a high heat, add oil then quickly stir fry beef for 3-4 minutes, if you have a small wok do this in batches to avoid overcrowding. Remove from wok then set aside. Add and stir fry green capsicum for a minute. Pour mixed sauce and tomatoes then bring it to a boil. 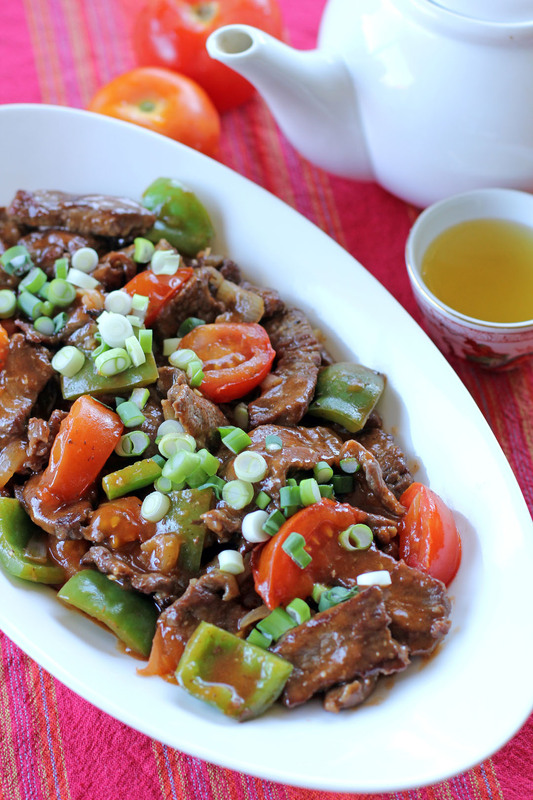 Once sauce starts to thicken add the cooked beef and spring onions, mix well to distribute sauce. Season with salt and freshly ground black pepper, you can also make it sweeter to desired taste. Hi Raymund. Wow, how funny that i never knew you worked in Hong Kong before. These kind of home style dishes remind me very much of traditonal foods and my mum does a version of this with eggs, rice and tomatoes too. Ooh, beef and tomatoes. Looks delicious. This looks like a restaurant dish ! I love that the marinade would make the beef so tender even though it’s cooked quickly. Yum! 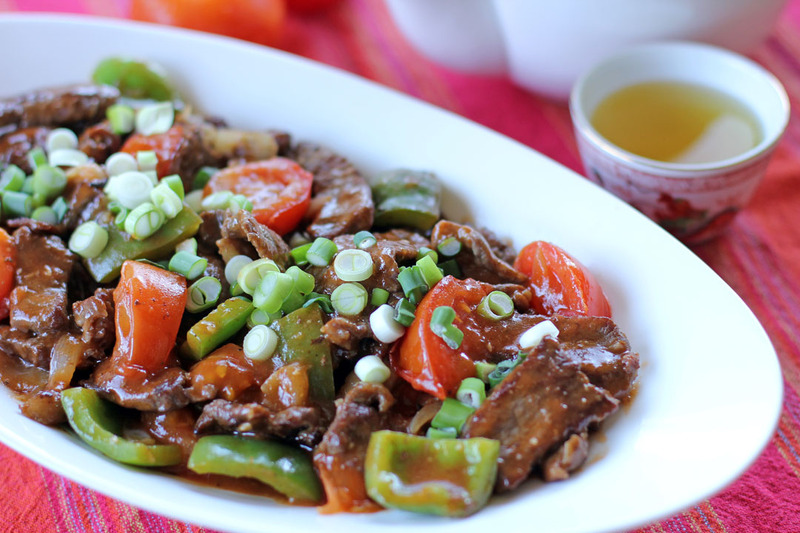 My mom’s stir-fried Beef & Tomatoes was one of the first things I learned to make when I lived on my own. This looks so good! I actually never tried this before (I think) but I love how simple it is to make this delicious dish! You can use wither apple juice or white grape juice. Thanks for asking! it’s very small amount of cooking wine, it would make no difference if you just you broth instead. When in a pinch, I have even used a small bit of cola and such. Enjoy. I made this for lunch today. It is an attractive dish but I wasn’t in love with the flavor. Too much ketchup or paste for me. When I make it again I will change the sauce a bit.